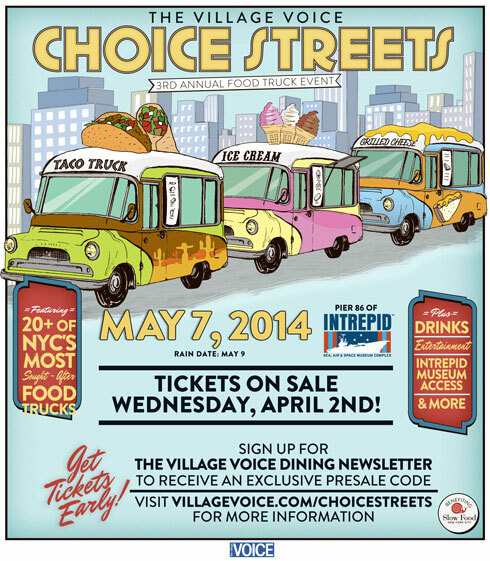 Have you marked your calendars for the return of the Village Voice’s Choice Streets Food Truck tasting event. This annual event returns to the Intrepid on Pier 86 on Wednesday, May 7th, 2014, with over 20 of the city’s favorite mobile eats. (Rain date: May 9th.) Indulge in delicious foods and drinks along the water and enjoy the amazing view. There will be a live DJ, entertainment, and guests can also tour the Intrepid. Over guests ages 21 and over are admitted. Presale tickets go on sale March 26th at noon. Tickets go on sale to the general public, April 2nd. All tickets include complimentary food tasting, unlimited beverages, access to The Intrepid, and entertainment throughout the night. The VIP ticket ($70) will allow guests a full VIP Hour beginnning at 7PM plus a gift bag and special VIP drink experience. The Early Entry ticket ($60) will allow guests entry into the event at 7:30PM, a full half hour earlier than the event’s door time. The General Admission ticket ($50) opens the event’s doors to all remaining ticketholders from 8PM until the event finishes for all ticketholders at 11PM. Check out highlights from last year’s Choice Streets.